Photographer Jeffrey Berkes captured this stunning moment as the moon entered full eclipse right when Old Faithful erupted in Yellowstone National Park on Sept. 27, 2015. Scattered showers and thunderstorm littered the landscape at Yellowstone National Park, but photographer Jeffrey Berkes captured this stunning moment earlier this year as the moon entered full eclipse right when Old Faithful erupted. The moon passed through Earth's shadow on Sept. 27, in a dazzling total lunar eclipse during a perigee full moon, better known as a 'supermoon' blood moon. Supermoons occur when the moon reaches its full phase at or near its closest approach to Earth, appearing much larger and brighter from Earth. For Berkes, the shot reminded him of nature's awe-inspiring beauty. 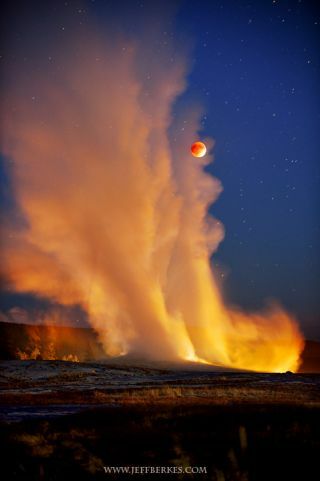 "I arrived in the morning to see when she was erupting and estimated the night eruption between 8 p.m. and 8:48 p.m. Around 8:15 p.m., the moon entered full eclipse then Old Faithful Erupted, one of the most magical moment in nature I have ever seen," he added. Another marvelous moon moment will occur this Christmas Eve, when a rare Christmas full moon rises for the holidays. Not since 1977 has the moon been full for Christmas, and it won't happen again until 2034. The online Slooh Community Observatory will host a free webcast of the Christmas full moon on Christmas Eve (Dec. 24) at 7 p.m. EST (0000 GMT). You can go to Slooh.com to join and watch the broadcast, and also see Slooh's library of past shows. You can also watch the broadcast here on Space.com, courtesy of Slooh.